In the early 90's I put together an optically switched, Radio Frequency (RF) over Fiber, communications system using early release RF over Fiber transceivers and one of the first available all-optical matrix switches. 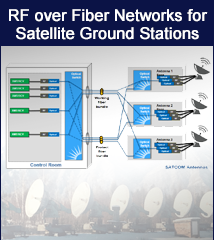 At that time RF over Fiber was a novel concept that was just becoming commercially available. It was my challenge to convince the RF engineers that I worked with to adopt this new optical technology and to overcome the "We've never done it that way before" syndrome. Now jump forward 25 years and things are more similar than they are different. Although the RF over Fiber and all-optical switching technologies have advanced greatly, RF engineers in many cases still have some reluctance to use fiber optics to solve their RF distribution challenges due mostly to the lack of familiarity with optical technology. And, I'm still challenged to convince RF engineers of the multitude of advantages related to using an all-optical switch to dynamically route their RF signals! By the numbers. Why use optical fiber to distribute RF signals? OK, I'm convinced that using fiber optics to distribute my RF signals makes sense. What else do I need? And you'll need optical and RF cable connectors and RF-to- optical transceivers, and a multiplexer if you plan to run different channels on a single fiber, and a host of cabling and cable management products. That sounds complex, and different. We've never done it that way before. Should I stick with the old way? And so we come full circle. But the truth is that it's not that scary and the flexibility, operational efficiencies, and protection you gain are compelling. In these types of applications, where data is mission critical, most governments can't afford to lag. There is a learning curve, but it’s not steep. 25 years ago, when I was building that first RF over Fiber communication system, I couldn’t have truthfully made that statement. That's why I can appreciate the commitment Huber+Suhner has made to the RFOF application. Leveraging the company's core expertise in fiber optics, and making strategic acquisitions, we can supply best-in-class equipment for an end-to-end optically-switched RFOF complete solution. If you've been in the trenches, this will sound like a dream come true. But it's true and certainly achievable today. 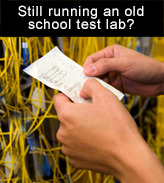 I have a long history with RF over Fiber deployments and have only touched on the benefits in this post. There’s a lot more to share. I'd love to help you think through how your RF distribution challenges might be addressed.